And so here I am, or here we are. Max and I doing what I like to call the Potty Training Dance. He’s been doing okay, not anywhere near the finish line and don’t expect to be for a couple more months. But I can say, being in the Two’s classroom at school, seeing all the other boys use the toilet and their cool underpants has definitely motivated this two year old. I was given a ‘talk’ by Max’s teacher, Miss Kelsey. It was a heart-to-heart really. She said no more jeans, only elastic waist pants. I was appalled at first, but knew it had to be done. You see we are family that gets dressed, we don’t wear sweatpants as an outfit. We wear nice clothes, we look nice, we take pride in our appearance. I will put the blame on my grandfather – he who wore a shirt and tie to cut the grass (there is picture proof!). He had more pride than I think Elizabeth Bennett did in Pride and Prejudice. But you know what, its trickled-down to this generation and I am perfectly okay with it. I know soon I will have to renounce my throne of what the boys will wear, but until then I am going to enjoy this. So to help with potty training confidence for Max, I will agree to elastic waist pants, but I will not forgo our dress code. Growing up too fast, I tell ya. Here you are eight months old. You are amazing. You are definitely your own person. You do things your way. You smile. You laugh. You cry. You absolutely love your brother. Each month you are here with us I have a hard time remembering what life was like before you, and even before Max. And you know what? I am totally okay with that because life is SO much better with you, and with Max. -you finally rolled over! It took some time, with some assistance at first, but now you can do it all on your own. One catch though, you only roll to the right side. -you are pulling yourself up at the coffee table, at the kitchen chairs, if you grab my legs, anywhere possible. You just want to be in the vertical position, simple as that. -you are pushing yourself all over the floor, though only backwards. -you are starting to get up on your hands and knees, getting ready to crawl. However, with the pulling up and always wanting to be standing, I wouldnt be surprised if you go from only rolling to the right, and pushing yourself backward to walking. -lots and lots of babbling - ba-ba's, ma-ma's, ga-ga's. -you dont like the little fruit or veggie puffs, but you love the teething biscuits. -you will cry when I take a shower. You start to cry as soon as I close the curtain and will stop when I am done. -you love being on the bed - whether its mine or Max's - with Max. You two start a decent giggle fest. -you've been experiencing quite a bit of pain with the top teeth. They havent made an appearance yet, but I'd imagine soon. -you still love your swim class. -we had our first 'us-only' trip to the Wisconsin Dells to meet some new friends. You did awesome given your complete distaste for the car and car seat (yes, you still do not like them, however its getting easier as you will get distracted with your brother). We are definitely operating as a family unit now. I love it. Max loves it (most of the time). You love it. Thank you for being just who you are. This is an action sequence - he was attacking the bear, squealing and doing a little leg kick. Love this kid. His thoughts and ideas and all around being amazes me every single day. This was taken a couple of weekends ago after my awesome girlfriend Amy passed along this truck to us. I hate that he is growing up so fast, but I sit here and watch this over and over and am blown away with what he knows and what to do, and cant wait to see what the rest of his life brings. Im Fixing It Mama from Melissa Mensavage on Vimeo. Those prayers for precipitation paid off. We had a good couple of weeks of either snow, rain, snow/rain mix. It wasnt all that great for commuting, but it was all that great for this. 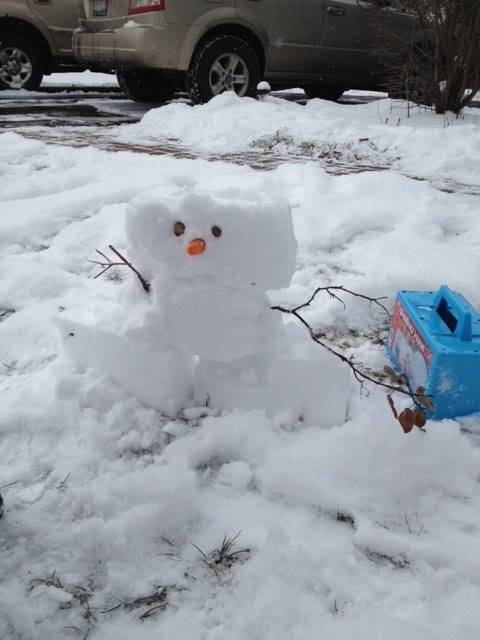 Our first snowman. The snow wasnt at all snowman-making snow but we were creative. 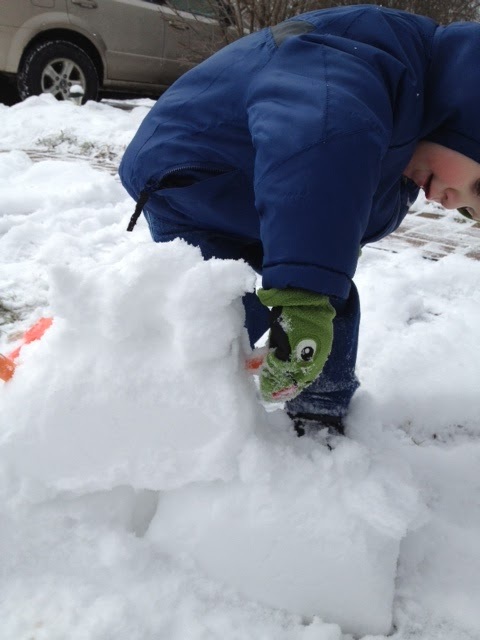 My sweet boy is a snow-lover to the core. Takes right after his mama. I am so proud. Every day I am committed to spending quality no-tv time with Max and Theo. Well, every day its on my to-do list. It doesnt always happen. Though last night, I most certainly made the time as its been a late night every week - late leaving work, late getting home, late eating dinner, late getting to bed. So last night I treated us to McD's for dinner, which we had while mobile (ie, in the car) so that when got home, all I had to do was put our things away and then we could play. Over the holidays I noticed my cabinets and pantry is packed full of goods that could be used (and should be used) for creating delicious meals. I started googling for recipes to start using up all these items. I mean I paid for them and they are just sitting in my house collecting dust and most likely going to waste as some I am sure have expired already. I'm pretty impressed with my creativity in accomplishing this task of using what is in the pantry, as I am not anywhere near a decent cook. My food always turns out bland or overcooked. But on some occasions, its decent. Especially my latest. What else would you do with these two items? 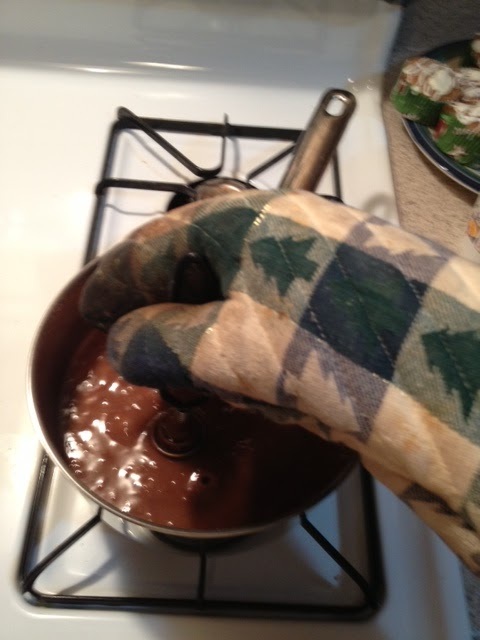 Make chocolate pudding, of course. Nothing to write home about but certainly better than the store bought ready-made stuff. 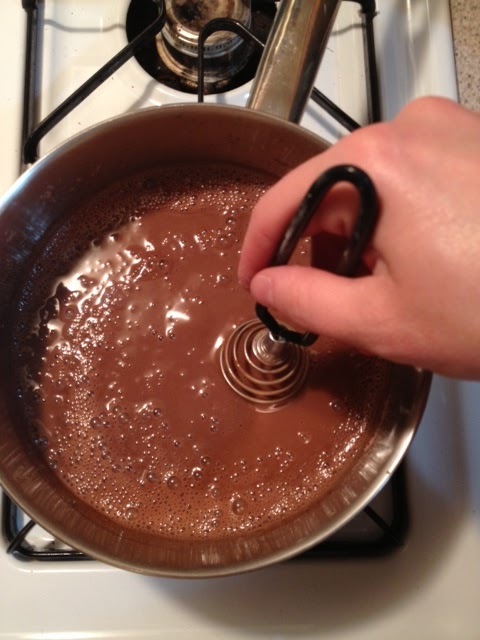 I'll have to find the recipe and post it here but its simple 1 cup of hot chocolate mix (or 5 packets), 3 tablespoons of cornstarch and 2 cups milk. Heat milk first, then add the dry mix, stir constantly until starts to thicken (took me maybe 3 to 4 minutes). 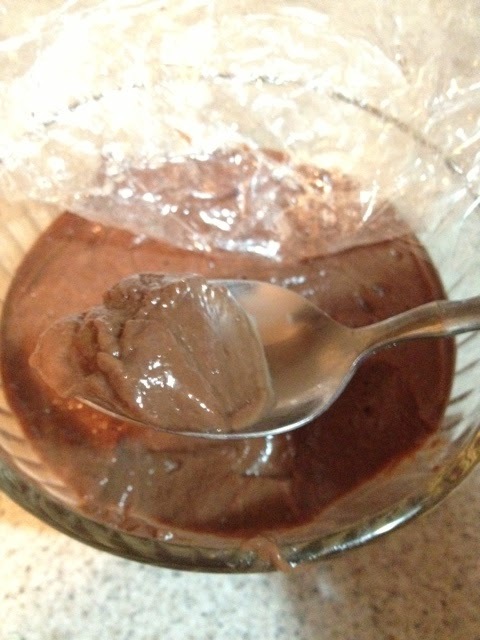 Remove from heat, pour into a container that can withstand the heat and refrigerate. Makes about two cups. Add oven mit after a minute or two as you start to burn your hand (or that is just me!). Add plastic wrap to top to prevent that nasty film from forming and refrigerate for atleast a couple of hours. I did it overnight, and this is the finish product before giving it a good stir. Once I gave it that good stir I mentioned, its nice and creamy and a little too sweet for my liking, but still pretty good. It definitely needs some whip cream for the top. Anyone else have recipes for Cornstarch? I have a ton of it - two containers in fact. I dont really care to get too deep for too long. It can be such a downer. So I've said whats been on my mind this January, and I am done. Its now February. The month of love. The month where serious cabin fever and the hibernation 15 sets in (you know those unwanted pounds we all gain during the winter months - oh wait, is that only me??). We've pretty much have had a mild winter, which is a bit surprising considering the sweltering summer we had. Or maybe that is how it works, one brutal season, one mild season. Who knows. Anyway, I've had to stop listening to the news on the radio (because we know I dont watch it) as I didnt want to hear about the drought. Even in the winter we are still experiencing drought-like conditions. Then a friend at work told me they are going to shut down the Mississippi River because the water is too low for the barges to make it through. I panicked. And then I prayed really hard for snow. I had a bye week on the regular family, health, happiness prayers and all I asked for was precipitation. Wouldnt you know we've had quite the week of precipitation and from the looks of it it could possibly continue. How great was this moment? I was so late for work, but totally worth it. It was a bit of a hassle getting him outside - it wasnt bitter cold, I still wasnt ready to leave just yet - so I basically picked him up, carried him to the edge of the garage, handed him the shovel and said, 'play! 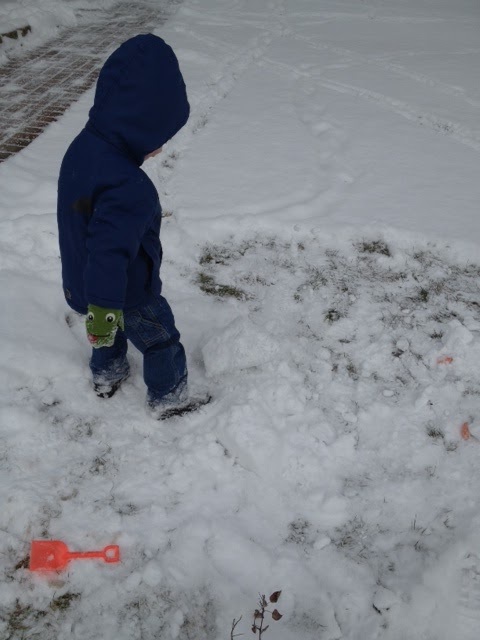 shovel the snow for mama! ', showed him how to do it quickly and then ran back in the house. I come out to check on him and he was still standing there just looking at the snow. I said more encouraging words to him and then went back inside. Came out again to check on him and load stuff into the car, and voila! The dude was all over the driveway. He was in love. He cried when it was time to go. I promised we would play when we got home that night and we did. 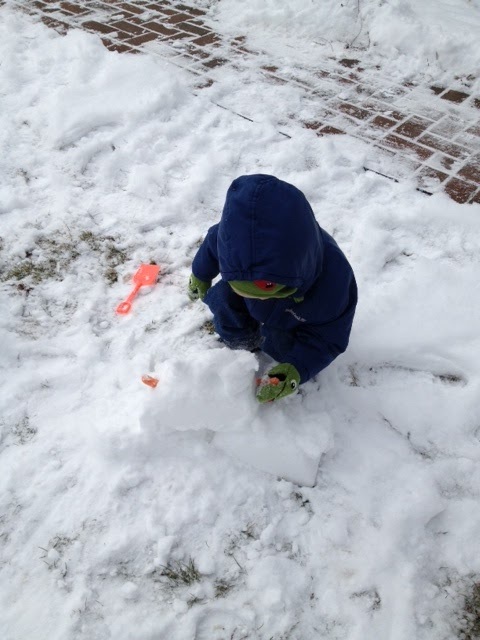 My boy is a snow-lover, just like his mama. Yay! And a bigger Yay!, though not so much for the temps, the forecast. Thank you Mother Nature for answering my prayers. Keep it coming! !